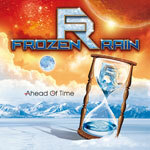 Kurt Vereeke launched his first Frozen Rain project in 2008; the eponymous album was a testament to his love for all things AOR and melodic rock. He returns with his second effort, Ahead of Time, another strong effort. Above, Frozen Rain: no sign of winter precipitation in tonight's forecast. The first time out involved a gaggle of AOR celebrities offering their talents to the project, including numerous lead vocalist. For Ahead of Time, Vereeke assembled a six man band, which includes his brother Hans on drums and notable singer Carsten 'Lizard' Schulz handling all the lead vocals. For the music, one might say that this disc is a bit edgier, even heavier, than the first. Songs like Turn It On, We're Gonna Rock, or The Last Dance Ain't Over have some real hard rock gusto. Conversely, Breakin' Out, though a little repetitive, has that accessible, radio-friendly, AOR appeal. The Way That You has a real soaring anthem feel, much due to the guitar work. (Guitarist Rik Priem does a fine job across the entire album.) It's hard to believe but there's only one ballad on this AOR album: Too Late, written by Vereeke's daughter Joke (yes, that's her name). The album finished with a fine melodic rock instrumental, Voodoo Party. With an established ensemble of players, Frozen Rain delivers another fine album. Easily recommended. Now with an established 'band,' which includes a single leader in Carsten 'Lizard' Schulz, Frozen Rain delivers another fine AOR/melodic rock album.